Disneyland Measles Outbreak Hits 59 Cases And Counting : Shots - Health News People from 7 months to 70 years old have fallen ill, and one quarter of the victims have been hospitalized. California officials say it's proof yet again of how easily measles spreads. People who visited Disneyland in December were at risk of getting an unwelcome souvenir: the measles. The measles outbreak that started at Disneyland and one other California theme park is expanding, with 59 confirmed cases in patients ranging in age from 7 months to 70 years. The California Department of Public Health has linked 42 of these cases to people who visited Disneyland or Disney's California Adventure Park. 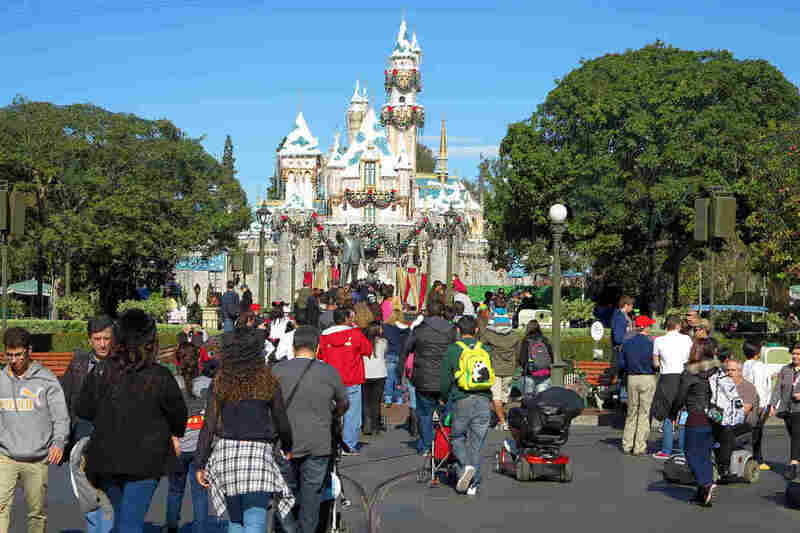 Initially, cases were linked to people who visited the parks in mid-December, but health officials now say that other people with measles were at the parks in January while infectious and also have spread the disease. The outbreak has spread beyond California with seven cases in Utah, Washington, Colorado and Oregon. Mexico has also confirmed a case. Vaccination status is known for 34 of the California patients. State officials say that 28 were not vaccinated at all, one was partially vaccinated and five were fully vaccinated. Six of the unvaccinated were babies, too young to be vaccinated. "Measles is not a trivial illness," state epidemiologist Dr. Gil Chavez said Wednesday. "It can be very serious with devastating consequences." Those consequences include pneumonia, encephalitis and even death. Before the measles vaccine was introduced in 1963, 500 people a year died of the disease nationwide. In the current outbreak, 25 percent of people with measles have been hospitalized. "If you are not vaccinated, stay away from Disneyland." In 1989-1991, a measles epidemic swept California and other places around the U.S. There were 17,000 cases in California, and 70 people died. In Philadelphia, nine children died in just three months. "The city was in a panic," Dr. Paul Offit of Children's Hospital of Philadelphia says. "I saw children die of measles dehydration ... measles encephalitis. Measles can kill you." Chavez stressed that Disneyland was a safe place to go — as long as you are vaccinated. "If you are not vaccinated, stay away from Disneyland," he said. The problem is not with Disneyland itself, but any place where large numbers — including people from foreign countries — congregate. Chavez described Disneyland staff as being helpful and "quite concerned" about the outbreak. Five Disneyland staff members are among the 59 cases. Measles was declared eliminated from the United States in 2000, but can still be reintroduced if someone from another country is infected and travels to the U.S., or an unvaccinated person in the U.S. travels abroad and brings the illness back. Measles is a highly infectious, airborne illness. It starts off with fever as high as 105 degrees, followed by symptoms that resemble a cold — a cough and runny nose. The hallmark of measles is a red rash that appears first on the face and upper neck, and then spreads to the rest of the body. If someone with measles coughs or sneezes it can spread droplets of virus that can live on surfaces for up to two hours. On the press call with reporters Wednesday afternoon, Kathleen Harriman with the California Department of Public Health described published case reports of a person with measles at a basketball game — and people across the court became infected, "because the virus can float and hang out in the air for a long, long time," she said. Chavez urged everyone who was not vaccinated to get immunized. The first dose of vaccine, called MMR as it protects against measles, mumps and rubella, is given at 12 to 15 months of age. The second dose is given at age 4 to 6. Most people who get the vaccine do not experience side effects, but the most common ones are fever and a mild rash. If you were born before 1957, you are presumed to be immune to measles, because the disease was so widespread before the introduction of the vaccine. For years, only one dose was recommended; it protects 95 percent of people. The second dose was recommended starting in 1991. If you don't know your vaccine status, Harriman said you can safely get the MMR vaccine — if it's an extra dose it won't hurt you, she said. Local health officers in counties affected are busy tracing those who infected patients have been in contact with. Dr. Erica Pan, deputy health officer of Alameda County, says the county has shifted resources from Ebola preparedness to contact tracing for measles. Last year there were four cases of measles in Alameda County, she said, "but we had 400 contacts to investigate." The measles outbreak comes after years of increases in the number of parents who refuse to get their children vaccinated. In California, the rate of kindergarten parents choosing the "personal belief exemption" to refuse vaccines doubled from 2007 to 2013. While the statewide rate of personal belief exemptions reached 3.15 percent, geographic clusters had significantly higher opt-out rates. But that steady increase in vaccine refusals was halted with the current school year — likely due to a new California state law. This school year is the first when parents who chose to opt out needed to meet first with a health care provider to discuss vaccines and vaccine preventable illnesses. The goal is to dispel misinformation and fear of vaccines. The opt-out rate dropped from 3.15 to 2.54 percent, nearly a 20 percent decrease. That change in vaccine refusals may be too late to make a difference in this outbreak, but state officials are nonetheless pleased. "That may change the number of people opting not to vaccinate out of pure misinformation," Chavez said. This story was produced by State of Health, KQED's health blog.